Transitional pendant ceiling lighting that is mouth blown made and hand-finished by skilled craftsmen. You can easily adjust the cord's length to fit your desire setting, no hardwire installation required. Suggested Room Fit: Dining room, Kitchen, Bed room, Small Room. Dimmable and Adjustable - Come with an on/ off dimmer switch which is located 3.2ft from the plug, pretty easy to find and create the perfect ambience you desired and make your light more attractive and eye catching. 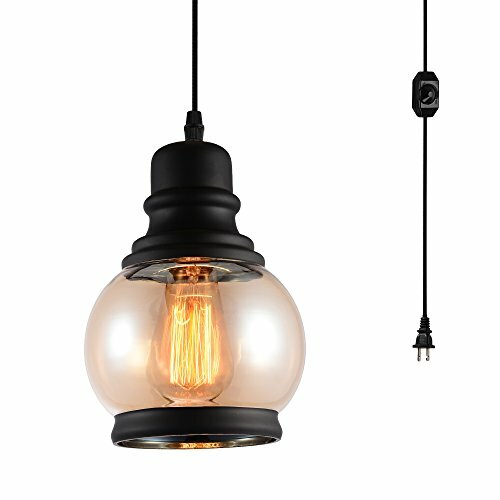 Transitional Industrial Design - Hand Worked industrial glass pendant lights with on/off dimmer switch and 15 ft hanging cord, perfect chandelier lighting for hallway, entryways, living room, dining room, bedroom or Kitchen Island.